No surprise here. 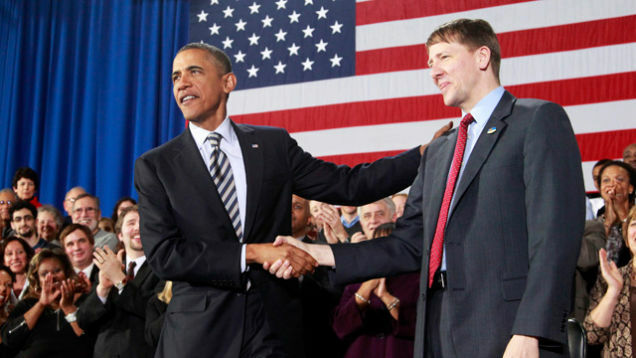 Top Republicans are ripping President Obama's decision to recess appoint his top consumer watchdog, Richard Cordray. "Although the Senate is not in recess, President Obama, in an unprecedented move, has arrogantly circumvented the American people by ‘recess' appointing Richard Cordray as director of the new CFPB," Senate Minority Leader Mitch McConnell said in an official statement. "This recess appointment represents a sharp departure from a long-standing precedent that has limited the President to recess appointments only when the Senate is in a recess of 10 days or longer. Breaking from this precedent lands this appointee in uncertain legal territory, threatens the confirmation process and fundamentally endangers the Congress's role in providing a check on the excesses of the executive branch." House Speaker John Boehner said, "This action goes beyond the President's authority, and I expect the courts will find the appointment to be illegitimate." It's unclear who would have legal standing to challenge Cordray's recess appointment, though we're looking into that and trying to suss out which stakeholders - both in Washington and in the financial services world - would have an appetite for it. On the unprecedented nature of the appointment, McConnell and Boehner have a decent case. Both parties have used pro forma sessions to avoid recesses and thus block Presidents from making recess appointments - and, kosher or not, Presidents have respected this. Note - this is why some Cordray advocates were hoping to see him recess appointed yesterday, instead of today. Legal experts have opined on both sides of the argument. Former top Bush administration lawyers argued in 2010 that Obama should pick this very fight with the Senate. To mitigate the inter-party controversy, Democrats will note that Obama recess appointed Cordray because Republicans had vowed to block all CFPB nominees - in effect crippling it - until the agency was fundamentally weakened by statute. This too was unprecedented, and constituted a nullification of a key part of the Dodd-Frank law over policy objectives Republicans did not have enough backing to enact through the normal legislative process. But now that Obama has called the Senate's bluff on the use of pro forma sessions to block recess appointments, either the courts will have to weigh in, or that defensive practice will likely disappear. Republished with permission from TalkingPointsMemo.com. Authored by Brian Beutler. Photo via AP. TPM provides breaking news, investigative reporting and smart analysis of politics.